Heat gas or charcoal grill. Cut sweet potatoes into 1-inch lengthwise wedges (8 to 12 per potato). In large microwavable bowl, mix sweet potatoes and water. Cover and microwave on High 14 to 16 minutes, stirring once, until just tender when pierced with knife. Carefully drain sweet potatoes; let stand 3 to 5 minutes or until cool enough to handle. Brush sweet potato wedges with 2 tablespoons olive oil; sprinkle with 1/2 teaspoon salt and the red pepper flakes. Place sweet potato slices on grill over medium heat. Cover grill; cook, in batches if necessary, 12 to 15 minutes, turning once, until tender and grill marks form. Transfer to cutting board; let stand 5 to 7 minutes or until cool enough to handle. Cut into bite-size (3/4-inch) pieces. Meanwhile, in large bowl, mix 1/2 cup olive oil, the vinegar, mustard, 1/2 teaspoon salt and the black pepper. Add kale; toss to coat. Transfer to serving platter. 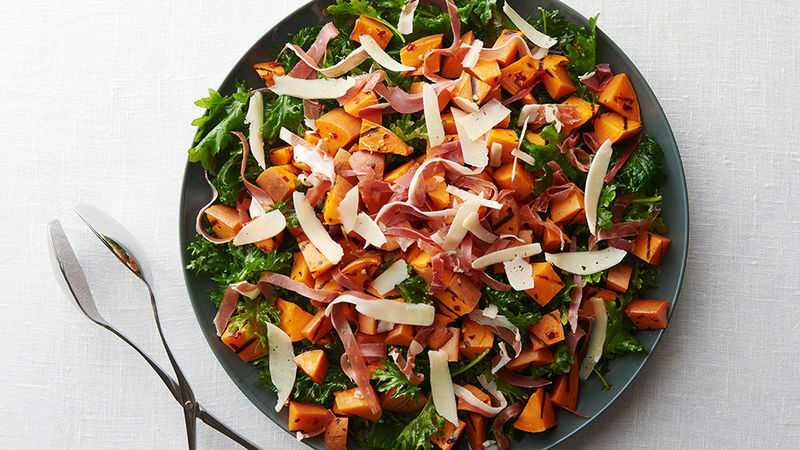 Top with grilled sweet potatoes, prosciutto and cheese. Salad vinaigrette can be made a day in advance, covered and refrigerated. Beat with whisk before mixing with kale. A flat, open spatula or “fish spatula” is helpful for turning tender vegetables like these sweet potato wedges. If you don’t have a fish spatula, tongs work well, but use a gentle touch.